Yep..the entire series on Aug. 23-24. I couldn't believe it myself when I saw the announcement a few days ago. For years, I thought that Get Christie Love was a made-for-tv movie based on blaxploitation films of the time. Kind of a lightweight Cleopatra Jones or Foxy Brown except she worked for what looked like LAPD. Anyway, about 10 years ago I bought a GCL dvd at the drug store and saw a 1.5 hour movie that was entertaining. 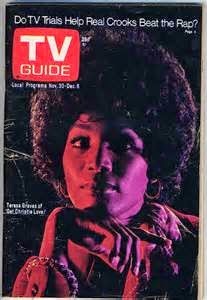 I'd been meaning to ask my mother, who went to school with the late Teresa Graves (Washington High in L.A., Class of '65) but when the subject came up, Moms would get a little weepy. I've got posts, old school videos to share (including a rare gem if you liked KDAY back in the day when it was on the AM dial) and more coming in the next few days. In the meantime, I've got my popcorn and other snacks ready!